RBTH presents a selection of views from leading Russian media on the latest developments in Ukraine, including analysis of the deal reached on postponing the opening of a free-trade zone between the EU and Ukraine, and the preparations by various parties for the upcoming parliamentary election. The European Union and Ukraine have reached a consensus on the association agreement: A free-trade zone between them will not come into effect until December 31, 2015. This has to do with the fact that the Ukrainian economy is in a difficult situation and is currently not competitive. Until the agreement comes into force, the EU will provide Ukraine with preferential terms "so that the EU market remains open to Ukrainian goods." The Expert magazine believes that if in the current situation the Ukrainian market were to be inundated with European goods, it would completely collapse. The magazine also points out that were Ukraine to establish a free-trade zone with the European Union, it would have to deal with tough measures imposed by Russia, with which it already has a duty-free trading regime (and for which a free-trade zone between the EU and Ukraine is extremely disadvantageous). Now that the introduction of duty-free trade with the EU has been postponed, Moscow and Kiev have an opportunity to continue a dialogue and to look for an acceptable form of cooperation. Still, Expert is convinced that "from the political and image point of view, this decision has become a defeat for Kiev": association with the European Union was one of the main demands of Maidan. "Now it turns out that the current Ukrainian authorities are doing exactly the same thing that [former Ukrainian President Viktor] Yanukovych did," Expert concludes. 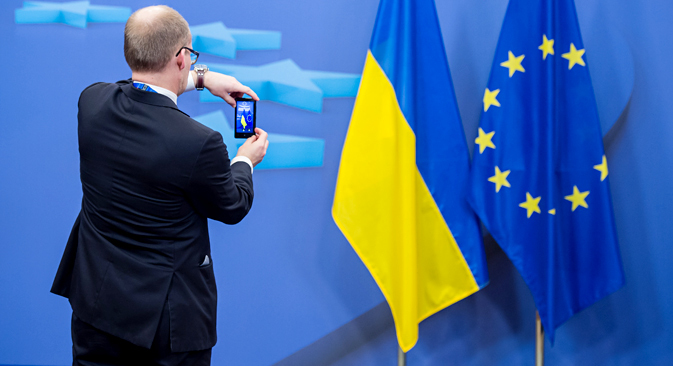 The Nezavisimaya Gazeta daily reports that the decision to postpone the setting up of a free-trade zone with the EU till 2016 has met with a mixed reaction in Kiev. According to the official line, the extension of the preferential regime till 2016, the Ukrainian Foreign Ministry believes, will enable domestic producers "to take advantage of unilateral preferential terms from the EU and win additional time to adapt to stronger competition within a Ukrainian-EU free-trade zone". However the decision, which was taken on Friday, has already led to the resignation of Ukrainian Deputy Foreign Minister Daniil Lubkivsky. This is how he explained his decision: "The adopted (at the meeting between Ukrainian Foreign Minister Pavlo Klimkin, Russian Economic Development Minister Alexei Ulyukayev and EU Trade Commissioner Karel De Gucht – NG) statement sends the wrong signal to everybody: to the aggressor, to the allies and, most importantly, to Ukrainian citizens. It is now that our economy, like a body fighting a terminal illness, should independently seize a chance for survival. A choice cannot be postponed; otherwise it is not a choice." Vladimir Gorbach, an expert with the Institute of Euro-Atlantic Cooperation, points out that Europe has in effect made a concession to Russia and has given some breathing space to Ukraine, all at its own expense. He believes that the current situation could be considered a tactical victory for Russia and that Ukraine's future depends on how the authorities will use this situation and who will be in power. The Kommersant daily analyzes the Ukrainian political party congresses that were held over the weekend as the parties prepare for the upcoming parliamentary election. The Party of Regions, which was the ruling party under President Yanukovych and now has an extremely low popularity rating, has decided not to run in the polls. The other parties, including the pro-presidential Petro Poroshenko Bloc, the People's Front, which was set up on the basis of the cabinet of ministers, and Yulia Tymoshenko's Fatherland, will clearly be running on a patriotic ticket and exploiting the popularity of "the heroes of the new post-Maidan era": those who participated in the winter rebellion in Kiev and in the military operation in southeast Ukraine. For instance, the list of candidates nominated by the Fatherland party is nominally headed by Ukrainian pilot Nadezhda Savchenko, who is currently being kept in custody in a Russian prison on charges of involvement in the killing of Russian journalists in the Donbass. Experts polled by Kommersant believe that the parliamentary election is likely to be won by the Petro Poroshenko Bloc. They also predict that participants in the "anti-terrorist operation" and Maidan, making use of their popularity and patriotic rhetoric, will be instrumental in "pushing forward" unpopular bills in the new Ukrainian parliament. Rossiyskaya Gazeta reports on the persecution that new “opposition” newspaper Vesti [whose funding is unclear – RBTH] is being subjected to in Ukraine. Over the weekend, the paper's editor-in-chief Igor Guzhva was detained on suspicion of organizing mass unrest, while several days prior to that a search was conducted in the Vesti offices as part of a criminal investigation into an "encroachment" on Ukraine's territorial integrity on the part of the paper's journalists.